Assam CM Sarbananda Sonowal distributed appointment letters to newly-recruited personnel into Special Rhino Protection Force at a programme held at Assam Administrative Staff College in the city on July 11, 2018. In an attempt to empower the Forest Department to protect the pride of Assam ‘one-horned rhinoceros’, Assam Chief Minister Sarbananda Sonowal on Wednesday gave away appointment letters to 90 youth as constables. 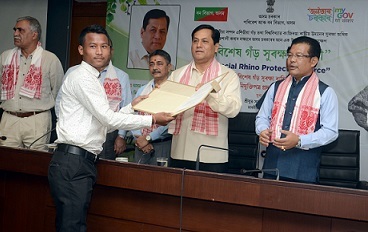 Chief Minister Sonowal while handing over the appointment letters said the newly-raised Special Rhino Protection Force would be a new face of the State Government’s efforts towards protection of wildlife in the State, especially rhinos. The newly-recruited youth will form the crux of Special Rhino Protection Force (SRPF) that the State Government raised for better protection of rhinos in Assam at a function held at the Assam Administrative Staff College here on Wednesday. It may be noted that in view of dangers posed by poaching of rhinos, the Government of Assam has decided to raise a Special Rhino Protection Force with the local youth hailing from the fringe areas of the Kaziranga National Park (KNP). The force would be exclusively used for Kaziranga National Park, Orang National Park and Manas National Park. Sonowal also said that the newly-recruited constables should maintain constant liaison with the higher ups of the security mechanism of Kaziranga National Park to form a formidable team for the protection of wild lives. The Assam CM said that the Government has devised a well laid out mechanism for their training, using latest technology to the appointees for their capacity building. Sonowal also urged them to develop a spirit of discipline, punctuality, dutifulness and commitment to take the protection measure altogether to a great height. He said that in recognition to their duty towards rhino protection, the forces from Special Rhino Protection Force would be given awards. Speaking on the slew of measures that the State Government has put in place for protection of rhinos and other wild lives, Chief Minister Sonowal said that the Government has formed fast track courts to bring the perpetrators of wildlife crime to justice. He at the same time assured of all Government assistance in empowering Special Rhino Protection Force to help them to live up to their mandate. Minister of State for Environment and Forest Naba Kumar Doley while speaking on the occasion gave an overview of different measures that the Government has been taking up for Kaziranga National Park and other national parks and wildlife sanctuaries and reserve forests in the State. Principal Chief Conservator of Forests NK Basu also spoke on the occasion. Legal advisor to Chief Minister Santanu Bharali, MLA Rituporno Baruah, Additional Chief Secretary, Environment and Forest Alak Kumar and a host of other dignitaries were also present on the occasion.